On my recent trip down to San Diego, I stopped by Toronado to check out the selection of beers. Similar to its sister location in San Francisco, they have a wide variety of draft and bottle beers. As it was a warm afternoon, nothing seemed more fitting than a saison. A saison is a style of beer from Belgium that is a delicious complement for a warm, sunny day. Saison Du Buff is a collaboration of the guys behind Dogfish Head, Stone Brewing and Victory Brewing. I was instantly drawn to this beer since it contains parsley, sage, rosemary and thyme. And like that classic Simon and Garfunkel song, it didn’t disappoint. As you can see, it’s a beautiful honey colored beer. What you can’t see in this picture is that it had a lovely, meringue like head. Despite having parsley, sage, rosemary and thyme in it, I couldn’t really distinguish these herbs in the smell or taste. This really smelled and tasted like a traditional saison, citrus and cloves with a dry finish. The thing I love about Saison Du Buff (and saisons in general) is that it’s simple and refreshing. At 6.8% ABV, this could be a session beer…especially on a warm, sunny, not a care in the world, San Diego afternoon. 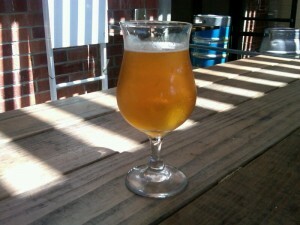 This entry was posted in Beers, Places and tagged saison, toronado by Melanie. Bookmark the permalink. Sounds like an interesting beer. I love the fact that in the USA (and Belgium) a 6.8% beer is considered a session beer. Most people over here would be scared!